Oil Gas Development Company Limited OGDCL Internship Program Via NTS has been announce. Last date to submit application is Tuesday, 31st July 2018. Oil and Gas Development Company Limited commonly known as OGDCL. It is a Pakistani multinational oil and gas company. OGDCL has a primary listing on the Pakistan Stock Exchange. Furthermore, OGDCL has a secondary listing on the London Stock Exchange. Established in 1961 by the Government of Pakistan. Oil Gas Development Company Limited OGDCL is the largest company in Pakistan in terms of market capitalisation. Application are inviting from fresh Graduate Engineers / M.Sc / MBA / BBA for one year internship program in OGDCL Oil Gas Development Company Limited. Those candidates are eligible to apply whose result has been announce on ore before 31st, July, 2018. All those candidates who are eligible must apply to grab this golden opportunity. Terms & conditions as well as other requirements for Oil Gas Development Company Limited OGDCL Internship Program Via NTS are mention below. Preference will be given to those candidates having domicile of districts in which OGDCL fields are located. The interns will be paid a monthly stipend of twenty thousand rupees. 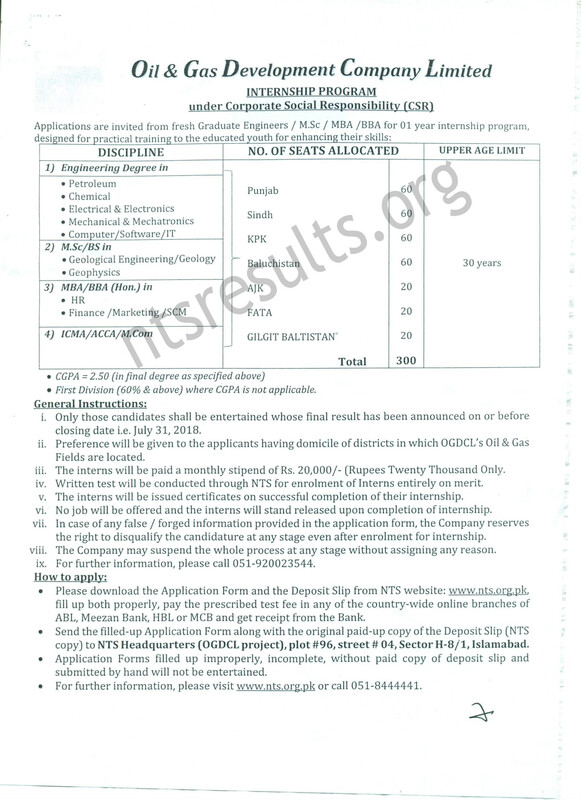 NTS will conduct the written test for the selection of interns. No job will be offered after the completion of internship. Incomplete applications forms will not be entertain. Last date to apply for OGDCL Internship Program is Tuesday, 31st July 2018.